It’s 12 p.m. on a muggy Sunday, and while many New Yorkers are just waking up, most of the 250-plus college kids crammed into AlleyNYC, a co-working space in midtown Manhattan, never went to sleep last night. Having arrived at 7 a.m. the day before, they’ve been here for a full 29 hours and by now the space, which is littered with coffee cups, high-fructose snacks and the remnants of last night’s Chipotle dinner, resembles an oversized dorm room right before finals. The majority of the students are clustered in groups, hunched over laptops, but a few circulate the venue, in search of food, caffeine or a couch to briefly nap on. The academic semester just started, however. Finals are still months away. These college students, mostly computer engineer and computer science majors, aren’t here to study. Their mission? Work together, in groups, to build a variety of software projects within a 36-hour timeframe. 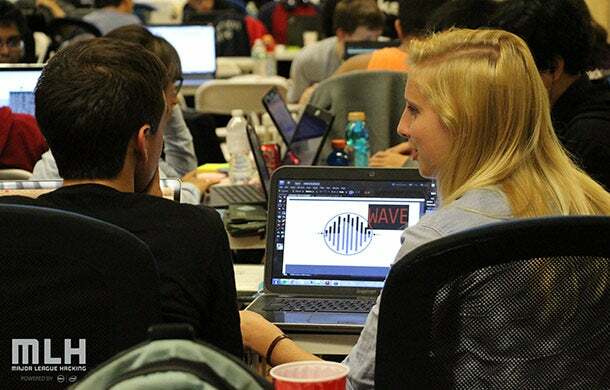 This, in other words, is a student hackathon – only different, explains Hanne Paine, the event’s lead organizer and fifth-year senior at Stony Brook University in Stony Brook, N.Y.
A double major in physics and computer science, Paine is heavily involved in the student ‘hackathon’ community; she's president of her university’s computer science club and, last November, organized for a city bus to charter Stony Brook students to Montreal for McHacks, held at McGill University. So far, she’s attended well over half a dozen hackathons at colleges across the country. What if there was a hackathon that, instead of just celebrating the end result, placed the focus was on learning, so attendees could experiment and pick up new skills without feeling embarrassed about their lack of expertise? Paine mulled this over on the bus ride back from Montreal, and just before dawn, as the bus neared the border, she resolved to organize an event – she’d already labeled it an ‘unhackathon’ in her head -- that would do just that. Ten months later, Paine’s ‘unhackathon’ is in full swing. It’s 3 p.m., and groups of students are setting up their laptops on foldable tables in order to demonstrate their projects to the judges. The room buzzes with last minute conferrals. It smells like 250 unwashed college students and anticipation. A blond girl, hair in tight pig tails, is rocking a cat suit. The outfit makes sense, considering her project -- she’s created an app that sends users obscure facts about cats every hour. A skinny freshman from Rutgers presents his team’s project – an app that groups user questions about a service or website based on the frequency in which they’re asked -- for one of the judges, Eugene Sayan, the CEO of Softheon. “I was in charge of writing the algorithm,” he explains. "I've been into mathematics since forever." In the corner, two sophomores from MIT are attracting a crowd as they demonstrate their project – dubbed Occam's raver -- for Jonathan Gottfried, another judge and the co-founder of Major League Hacking powered by Dell, the a company that helps organize student hackathons across the country. They've incorporated the virtual headset Oculus Rift to create a virtual environment in which the music volume and beat respond to the goggle wearer’s motions. “Our goal was to create a psychedelic musical experience,” explains one half of the duo, a blond with pink stripes in his hair. The assembled projects range widely in both subject matter and complexity. For more than half of the attendees, today is their first hackathon, a statistic that thrills Paine. On the event’s website, she took pains to ensure the language was inclusive and welcoming to people who wouldn’t necessarily consider themselves ‘hackers.' To evaluate attendees, she threw out the typical criteria – previous coding experience and prizes awarded at past hackathons – and selected applicants based solely on how they answered a series of questions, including what they hoped to learn from the experience. “We just wanted to make sure we had a thoughtful group." Paine is also pleased that 25 percent of the college students in attendance are female, a much larger slice of the whole than at most hackathons, where women, percentage-wise, often don’t break into the double digits. Earlier this morning, Paine sat down with a group of female attendees, many of whom were prompted to apply because of the event’s description, which emphasized they didn’t need to be an expert in order to attend. In terms of demographics, the student hackathon community looks a lot like the tech community: “overwhelmingly made up of white and Asian men,” Gottfried confirms. 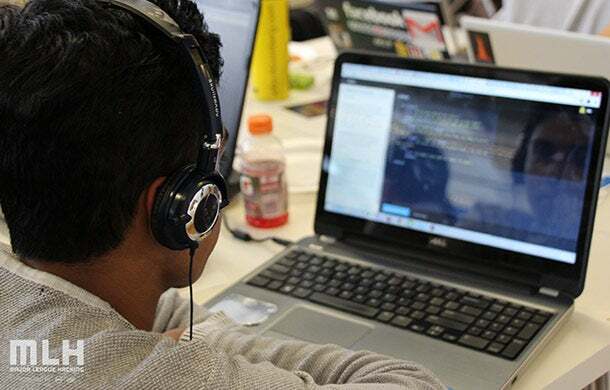 While student hackations “really only exploded in the past year or so,” there are already annual flagship events -- such as PennApps, hosted by the University of Pennsylvania, and LAHacks, which takes place at UCLA -- that attract thousands of hackers from all over the country. “They get pretty hypercompetitive because they'll often have 6,000 applications for a thousand spots,” Gottfried says. Smaller regional events like Paine’s, however, have the leeway to emphasize learning over competition, and have the potential to serve as an entry point into the tech industry for students who otherwise wouldn't consider studying computer science or engineering. “If you can make these events inclusive, that could actually have a cascading effect." Unlike most attendees, Arielle VanIderstine is a hackathon veteran. "This is my fourth," she estimates, bright-eyed despite the fact she didn't sleep last night. VanIderstine is from McGill, but teamed up with three guys from Rochester Institute of Technology. Together, they built a system for teachers that divides students into well-balanced teams for group projects. While she's been to more competitive high-profile events, VanIderstine likes this one better. "It's smaller, cozier, more relaxed," she says. "It's not about prizes and using APIs to get money, it’s about trying to learn new things, and meet new people." VanIderstine, a double major studying English literature and software engineering, live blogged her 'unhackathon' experience: "This is my first time working with HTML extensively, so that’s interesting," she wrote on Saturday afternoon. "Bootstrap is a life-saver. If I were going to sleep tonight, I think I’d be dreaming in divs…"
Editor's Note: Entrepreneur Media is an investor and partner with AlleyNYC, a co-working space in New York City.